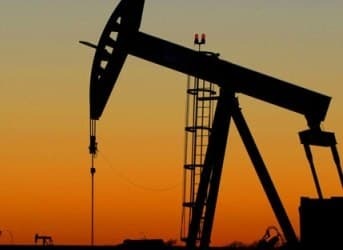 Home / What is Petroleum (Crude Oil)? Crude oil (a non-renewable resource) is usually found in underground areas called reservoirs. It is liquid in nature and yellowish black in color. They are composed mainly of hydrocarbons and organic compounds. They are usually discovered by oil prospecting scientists. Sometimes, petroleum and crude oil are used to mean the same thing, but petroleum itself is a broad range of petroleum products including crude oil itself. We use the term ‘petroleum products after crude oil is refined in a factory. 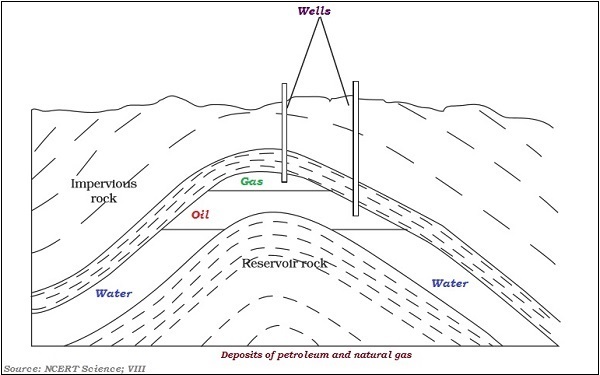 In oil drilling, a structure called ‘derrick’ is built with pipes going down to the reservoir and bringing the oil to the surface. The process of generating electricity from crude oil is very similar to that of thermal coal, which we saw on the previous page. Oil is burnt in turbines in power stations to produce extreme heat, which is used to create high-pressure steam. This steam is used to spin a turbine very fast by pushing against metal blades. The blades turn a generator containing wires and magnets and magnetic field produces electricity. The electricity flows to a transformer, which changes it to very high voltage electricity. The transformer also regulates the amount of electricity that is produced and supplied. Electricity is sent to homes, factories and other places in the world. A great chunk of all the total crude oil in the world is processed as gasoline, which we use for our cars. They can also be processed into liquid products such as rubbing alcohol, or solid products such as nail polish, water pipes, shoes, wax and crayons, roofing, vitamin capsules, and many other items.